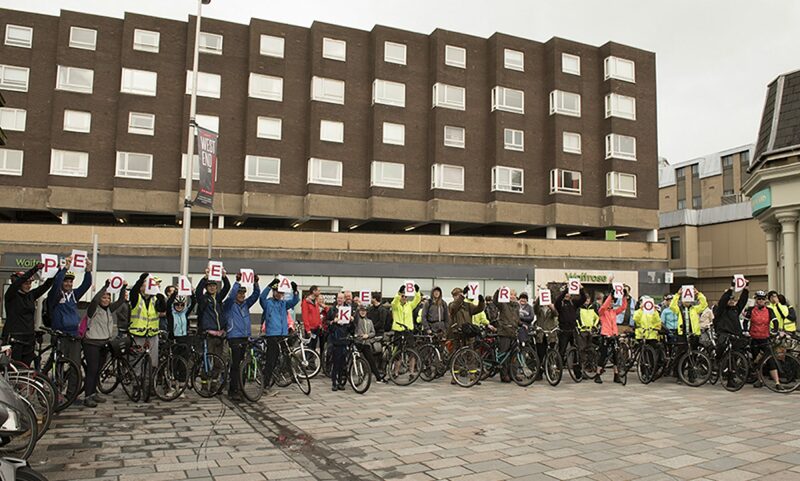 Sunday 27 August, “How much space – the Glasgow edition”, as per our post of 23 August, get along to GoMA at 10:15, for the iconic photo of bikes in Glasgow. From 31 August and through September, Glasgow Councillor rides. Our first one is with Christy Mearns, the new Green Councillor for Anderston/City/Yorkhill and we’ll be looking at Garnethill. Sunday 03 September, the GoBike September Lanarkshire Circular ride with an optional stop chez Jimmy Keenan in Uddingston. See http://www.gobike.org/about-us/cycle-rides Further details to follow. Tuesday 12 September, Connecting Clydebank Consultation, Clydebank Town Hall, 3pm – 8pm, see: http://www.west-dunbarton.gov.uk/business/regeneration/clydebank-town-centre-projects/connecting-clydebank/ Details to follow. Friday/Saturday/Sunday 15/16/17, Cycle Hack Glasgow, see: https://www.cyclehack.com/cyclehack-glasgow Details to follow. Saturday/Sunday 16/17 September, Cycling Embassy of Great Britain AGM and safari ride, see: https://www.cycling-embassy.org.uk/news/2017/07/20/save-the-date-embassy-agm-in-glasgow-16th-17th-september Details to follow. Previous PostPrevious How much space!